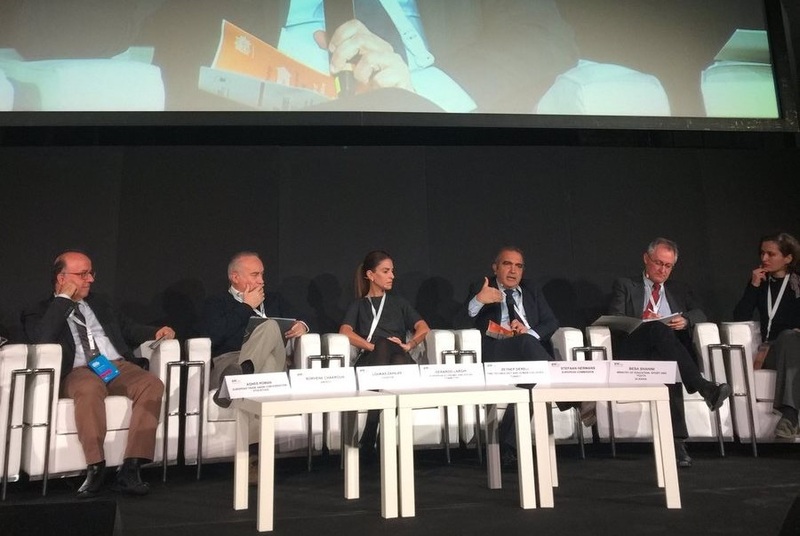 Cedefop Head of Department for VET Systems and Institutions Loukas Zahilas took part in the European Training Foundation’s (ETF’s) conference on ‘Skills for the future: managing transition’ in Turin (21-22 November) along with 300 delegates from 50 countries. Mr Zahilas was a panellist on the future of education and training in the European Union (EU) and beyond. He reflected upon the changing nature of education and training, including vocational education and training (VET), and discussed the expectations for the future. He presented Cedefop’s work on the future of VET in Europe and how this work can contribute to the EU cooperation framework in the area of education and training. The panel debated the present challenges, trends and opportunities as well as options to respond in an international context. ETF’s Georgios Zisimos moderated the session and the other panellists were Albania’s Deputy Minister of Education, Sport and Youth Besa Shahini, UNESCO’s Borhene Chakroun, TINK vocational school network founder and CEO Zeynep Dereli, from Turkey, the European Commission’s Stefaan Hermans, the European Economic and Social Committee’s Gerardo Larghi, and the European Trade Union Confederation’s Agnes Roman.